Super Sunday was exactly that for two members of the U.S. Sailing Team. 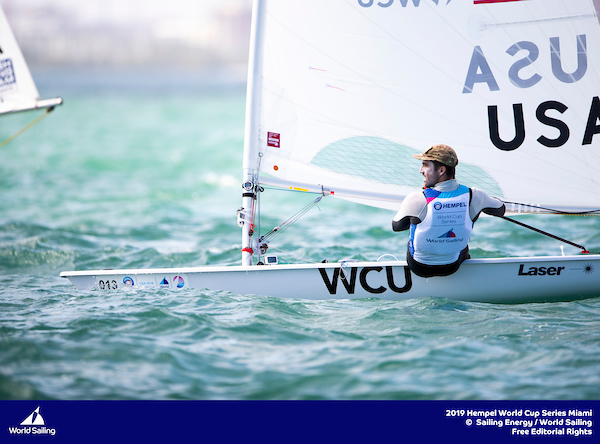 Paige Railey (Clearwater, Fla.) and Luke Muller (Fort Pierce, Fla.) stood on the podium earlier today to accept a silver and bronze medal, respectively, for their performances in the 2019 Hempel World Cup Series Miami, a crucial milestone on the road to the Tokyo 2020 Olympics. Railey had quite a bit of ground to make up if she wanted to overtake Dongshuang Zhang (CHN) for the gold in the Laser Radial class. And while there was an equally small chance that she could lose her silver medal to Vasileia Karachaliou (GRE), Railey never thought of starting the race with a defensive strategy. Zhang was quickly able to gain the upper hand and once she did, as Railey was the only person who could potentially steal the gold medal, Zhang merely had to keep Railey pinned toward the back of the fleet, which she did for the rest of the race, finishing ninth to Railey’s 10th. Railey won three races and finished second in another. But she also had some deep races. Her silver medal, she said, is a testament to perseverance. Railey has been racing at the top of the Laser Radial fleet for more than 15 years. She won the class’s world championship in 2005. Every year brings a new crop of hungry, young sailors who are constantly improving how the ubiquitous dinghy is sailed. Belief in one’s self was also a central theme to Luke Muller’s roller-coaster race in the Finn class. Medal Races don’t usually have more than one act. But Muller’s Medal Race was every bit a three-act drama en route to a bronze medal, his first in a Hempel World Cup Series event and his best international performance in the men’s heavyweight dinghy. Muller was last around the windward mark and eighth around the leeward mark. But in the light and shifty conditions that have prevailed in Miami this week, there’s always a passing lane or two that can be found. On the second beat he bounced up to fourth and then held off Max Salminen, who would win gold, on the final two legs to ensure a bronze medal. Other standout performances in the Medal Race came from Stu McNay (Providence, R.I.) and David Hughes (Miami, Fla.) who won the Men’s 470 Medal Race and jumped up to fourth and Charlie Buckingham (Newport Beach, Calif.) who finished second in the Laser Medal Race and likewise moved up to fourth. Both teams entered the Medal Race with an outside shot at bronze, but would’ve required help from other competitors to reach the podium. Atlantic and Nora Brugman qualified for a Medal Race for the second time in their careers and finished sixth in the Medal Race and eighth overall. 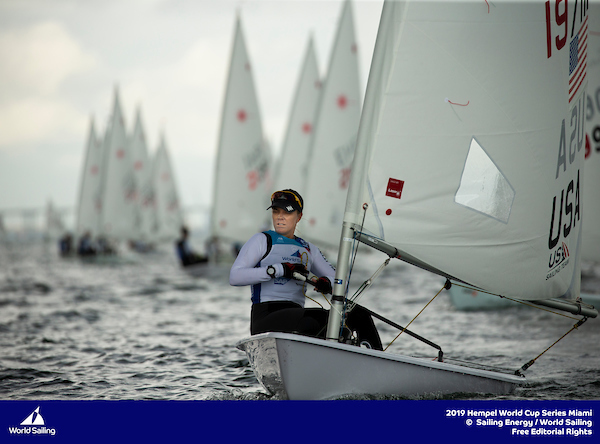 Erika Reineke (Fort Lauderdale, Fla.) continued her upward trend over the last few days of the regatta, finishing the Medal Race in fourth and the regatta in sixth. Olympic sailing has become a fixture on Biscayne Bay over the past 30 years. Page hopes that will continue for another 30 years or more. 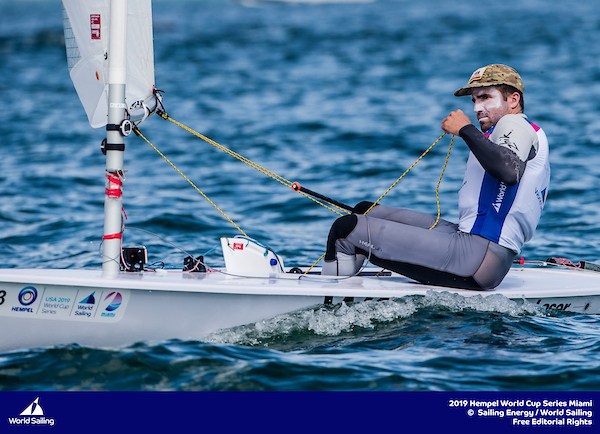 There are only two certainties on the final day of the second event of the 2019 Hempel World Cup Series in Miami, USA and that’s that Hermann Tomasgaard (NOR) and Sam Meech (NZL) will walk away with gold and silver in the Laser. A fight for bronze is on the Laser but in the Men’s and Women’s 470, Finn and the Laser Radial, the game is wide open with all the medals to be decided. Saturday’s action saw the 49er, 49erFX, Nacra 17, Men’s RS:X and Women’s RS:X conclude racing. Watch the races back here. The Olympic Channel: Home of Team USA will have coverage of the Hempel Sailing World Cup in Miami, Florida on February 2 and 3. Fans can catch all the action in spectacular high definition via OlympicChannel.com, or through the Olympic Channel app which is available on the iTunes App Store, Google Play, Windows Store, Roku Channel Store, Apple TV and Amazon Fire. 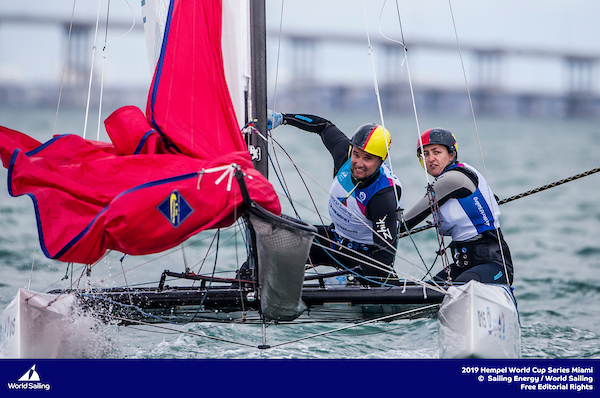 The first day of Medal Races at the 2019 Hempel World Cup Series Miami came and went without too much noise from the U.S. Sailing Team. Just three American teams qualified to compete in one of the five Medal Races held on Biscayne Bay earlier today, and none started their respective final races with a shot at a medal. But look beyond the podium in Regatta Park and champagne celebrations and there was a lot to be positive about from a regatta where the wind was capricious at best and downright mystifying at worst. Sarah Newberry (Miami, Fla.) and David Liebenberg (Livermore, Calif.) started the Nacra 17 Medal Race in 10th place and that’s where they remained once the boats finished. For a team that’s still getting their footing on the tricky foiling catamaran, however, this was a breakthrough performance. Rio 2016 Olympics Bora Gulari (Detroit, Mich.) and Louisa Chafee (Warwick, R.I.) also competed in the Medal Race. The finished seventh in the race and eighth in the regatta. 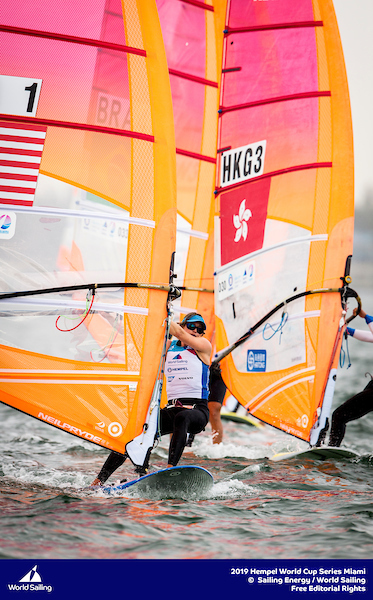 Stephanie Roble (East Troy, Wis.) and Margaret Shea (Wilmette, Ill.) picked up what was available to them in the 49erFX Medal Race, finishing sixth and securing a ninth overall. Roble and Shea were among the regatta leaders after three races before struggling in the second half of the event. But when an invite to the Medal Race was on the line, they pulled out another strong finish in the final full-fleet race and qualified by three points. In tomorrow’s Medal Races, which will once again be streamed live via the Olympic Channel app and on OlympicChannel.com, two Americans will start in full control of their medal destiny. Luke Muller (Fort Pierce, Fla.) won today’s only race in the Finn class and will start tomorrow’s Medal Race wearing the red bib indicating he is currently in the bronze medal position. But the competition in this regatta among sailing’s heavyweight division couldn’t be much tighter. First through seventh is alive for the gold medal, while eighth and ninth have a very outside chance at a podium finish. Paige Railey (Clearwater, Fla.) was forced to battle from behind in both of today’s Laser Radial races, moving from 33rd to 24th in the first and 42nd to 14th in the second. On the strength of her earlier results, including three race wins, Railey can do no worse than bronze. Finishing seventh or better will guarantee her a silver and she can claim gold if Dongshuang Zhang (CHN) falters. 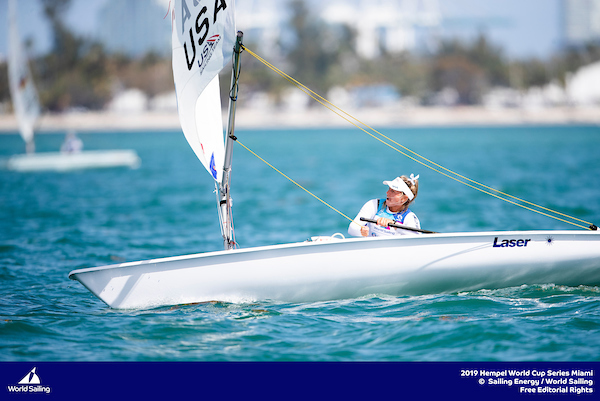 Erika Reineke (Fort Lauderdale, Fla.) started the day very much on the bubble of qualifying for the Laser Radial Medal Race. She stepped up to the pressure with a pair of top-10 finishes. The breeze has been shifty all week, but Reineke said that focusing on the wind velocity was more important today. With a strong performance tomorrow, Reineke could move up to fifth. But that possibility won’t affect how she approaches the race. 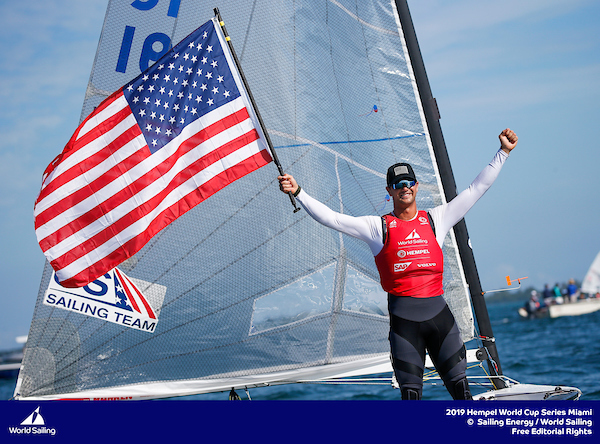 Onshore after two races today, Laser sailor Charlie Buckingham (Newport Beach, Calif.) could breath a sigh of relief. He’s the lone American in the medal race, with an outside chance at a bronze medal and a very realistic shot at fourth overall. Buckingham’s metronomic scoreline, which included 10 race results from sixth to 24th, and one 46th, belied the challenge of sailing in the regatta’s deepest fleet. He was pleased with his ability to more consistently sniff out the shifts than most of his competitors. Chris Barnard (Newport Beach, Calif.) was the second-placed American in 14th, 10 points out of the Medal Race. Stu McNay (Providence, R.I.) and David Hughes (Miami, Fla.) had an up-and-down day in the Men’s 470 fleet. They dropped to sixth overall, with a slim chance of bronze tomorrow. Lucas Calabrese and Jack Parkin were on the edge of qualifying for the Medal Race, but missed out by 3 points. In the Women’s 470 fleet, Atlantic and Nora Brugman are ninth and will sail tomorrow’s Medal Race with a legitimate shot of moving as high as fifth. Carmen and Emma Cowles (Larchmont, N.Y.) won a race today, showing flashes of the talent that lifted them to back-to-back world sailing youth championships in the 420 class. They finished 16th, with Nikole Barnes (St. Thomas, U.S.V.I) and Lara Dallman-Weiss in 17th, courtesy of a tiebreaker with the Cowles twins. Light air usually means a lot of passing lanes and opportunities to atone for a poor start. At times, it appeared that Maloney and Meech would be able to grind into the top six, which would’ve guaranteed them the gold medal. But in the end Grael and Kunze hung on for second and Maloney and Meech came out on the wrong side of a tough battle on the final run with Stephanie Roble and Margaret Shea (USA) and Odile van Aanholt and Marieke Jongens (NED). The Kiwis finished ninth and dropped into silver. Charlotte Dobson and Saskia Tidey (GBR) were fourth in the race to earn the bronze medal. The pin end was also the popular starting spot for the 49er class. In fact, there were so many boats starting at the pin end that fully half of the 10-boat fleet was over the line early. Among those crossing the line prematurely were Dylan Fletcher-Scott and Stuart Bithell (GBR) and James Peters and Fynn Sterritt (GBR), who started the Medal Race second and third, respectively. Only Fletcher-Scott and Bithell returned to start properly. But they were so far behind there was no chance of challenging pre-race leaders Erik Heil and Thomas Ploessel (GER) for the gold medal, even though the German team didn’t exactly have the greatest start. Both the Laser and Laser Radial fleets were able to scratch and claw their way to a full series. Hermann Tomasgaard (NOR) had his first bobble of the regatta, with a 30th, but rebounded with a third in the final race and will take a stunning 65-point lead into tomorrow’s Medal Race. He has locked up gold, and by no small margin. Sam Meech (NZL) has secured silver, provided he finishes the race, while Tom Burton (AUS) will need to hold off a handful of sailors with an outside chance of winning bronze. Burton must finish fifth or better to ensure himself of a medal. The Finn class is set up for a very competitive Medal Race. No position in the top three is secure, with first through seventh mathematically alive for the gold. The class will put the live scoring algorithm to the test tomorrow. Max Salminen (SWE) has the lead by four points over Jonathan Lobert (FRA) and eight points over Luke Muller (USA), who won today’s only race. But just three points separate Muller from Oskari Muhonen (FIN) in sixth. The top three boats in the Women’s 470 fleet are separated by just four points, setting up an intriguing battle for the podium positions. Frekerike Loewe and Anna Markfort (GER) are currently at the top of the standings with Hannah Mills and Eilidh McIntyre (GBR) second and Fabienne Oster and Anastasiya Winkel (GER) in third. Should any of those teams falter in the Medal Race, Fernanda Oliveira and Ana Luiza Barbachan (BRA) will be eager jump onto the podium. The nature of the Medal Race, which counts for double points and as the tiebreaker, means that any two teams within two points of one another are effectively tied. Anton Dahlberg and Fredrik Bergström (SWE) may lead the regatta by a point over Spain’s Jordi Xammar Hernandez and Nicolás Rodríguex García-Paz, but it will be a who-beats-whom battle for gold tomorrow. Naoki Ichino and Takashi Hasegawa (JPN) and Balázs Gyapjas and Zsombor Gyapjas (HUN) are tied for third and technically alive for gold. But it’s given the 14-point spread from second to third, it’s probable those latter two teams will be marking one another in the race for bronze. Racing commences at 12:00 local time and will be available to watch on World Sailing’s YouTube and Facebook. Medallists in the 49er, 49erFX, Nacra 17, Men’s RS:X and Women’s RS:X will be decided today and there is plenty that can happen with the scores tight at the top of the leaderboards. Teamwork takes on a new meaning when it’s just you and your partner skimming across the water at 30 knots on the Nacra 17’s tiny hydrofoils. There’s little time for verbal communication, so every move must be perfectly choreographed. And mistakes can be costly. You have to know what your partner will do before he or she does it. 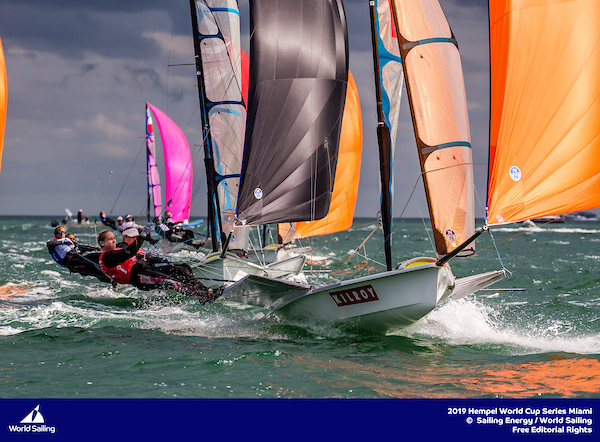 But that wasn’t the sort of teamwork that Louise Chafee (Warwick, R.I.) was praising after she and skipper Bora Gulari (Detroit, Mich.) won the day, with 13 points across three races on Day 4 of the 2019 Hempel World Cup Series Miami, and qualified for tomorrow’s double-points Medal Race. She was instead referring to the genuine partnership that exists between the handful of American teams competing in the class. Only one of them will qualify for the 2020 Olympics in Tokyo in 18 months time. But for any American team to go there with a hope at a medal, they must all work together to lift their collective game. Sarah Newberry and David Liebenberg (Livermore, Calif.) will join Gulari and Chafee in the Medal Race, which will be aired live along with the four other Medal Races scheduled for tomorrow via the Olympic Channel app and OlympicChannel.com online streaming platform. Chafee knows first-hand the level required to win an Olympic medal. She and Gulari sailed together at the Rio 2016 Games, finishing eighth. They each competed with different partners for the first half of the quad before reuniting this fall. An intense training block, which started in November, has put them back in the hunt. But they struggled out of the gate in Miami. They closed out yesterday with a win and were at the sharp end of the fleet all day today, in conditions that flummoxed even the defending gold and silver medalists in the class. Chafee explained that in the Nacra class—if not in all the Olympic classes—mistakes happen. No one is immune. In terms of the overall results, there isn’t a lot of opportunity to move up for either American team in the Medal Race. But there’s a lot of time until the 2020 Tokyo Olympics and the U.S. team is moving, as a group, in the right direction. Ravi Parent (Sarasota, Fla.) and Caroline Atwood closed the regatta with a second and moved into 13th overall while Riley Gibbs (Long Beach, Calif.) and Anna Weis were 15th. No other country had more than two teams in the top 15. Only one other U.S. team will sail in tomorrow’s Medal Races. Stephanie Roble (East Troy, Wis.) and Margaret Shea (Wilmette, Ill.) were unable to keep up the pace that had them leading the regatta at one point. But they pulled out an eighth place in today’s final race and move into ninth overall. They have a decent shot at moving up one space during tomorrow’s race. Paris Henken (Coronado, Calif.) and Anna Tobias were the second-placed American team in 17th. No fleet saw more movement at the top of the standings than the 49er fleet. Two American teams were, at one time or another, inside the top 10. But when the dust settled after two races today, neither qualified. Ian Barrows (St. Thomas, U.S.V.I.) and Mitchell Kiss (Holland, Mich.,) led the American squad in 14th. Nevin Snow (San Diego, Calif.) and Mac Agnese (Fort Lauderdale, Fla.) were 19th. In the RS:X classes Farrah Hall (Annapolis, Md.) and Pedro Pascual were the top American finishers in 27th and 37th, respectively. Among the fleets that will finish their full-fleet races tomorrow in preparation for Sunday’s Medal Races, the news was better. 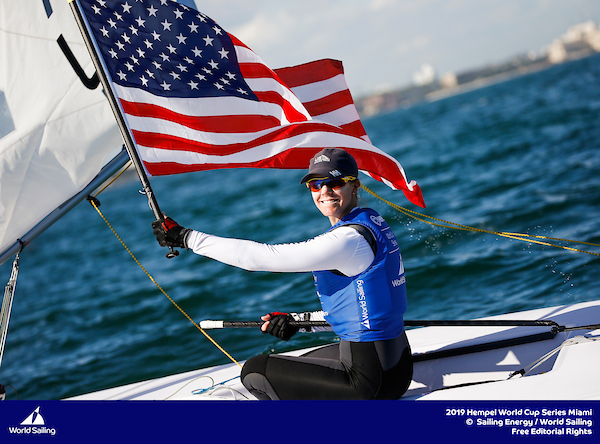 Paige Railey (Clearwater, Fla.), dominated the Laser Radial class with a fifth and two firsts. With eight races down and two more tomorrow, she has a nine-point lead over second place. Erika Reineke (Fort Lauderdale, Fla.) is 12th and just one point out of 10th. Charlie Buckingham’s (Newport Beach, Calif.) consistency in the Laser fleet has him in fourth, one point out of third and 19 points out of silver. Hermann Tomasgaard (NOR) has dominated this regatta in a way not often seen. He has just 21 points through nine races. Chris Barnard (Newport Beach, Calif.) is 11th and in striking distance of the top five. Caleb Paine (San Diego, Calif.) broke through for a win in the second Finn race today. But he still has a bit of work to do to make the Medal Race. Luke Muller (Fort Pierce, Fla.) is in a very strong position, sitting sixth with up to three races tomorrow, though the top half of this class is very tightly packed. The Men’s 470 class has two teams in the top 10, Stu McNay (Providence, R.I.) and David Hughes (Miami, Fla.) are seventh while Lucas Calabrese and Jack Parkin are 10th. With just six races finished and up to three scheduled for tomorrow, there’s the potential for a lot of movement at the top of the standings. In the Women’s 470 class, Atlantic and Nora Brugman are currently seventh, but will need to hold off a host of strong teams to make the Medal Race on Sunday. 49er, 49erFX, Nacra 17 and the RS:X windsurfer Medal Races will be live across World Sailing’s YouTube and Facebook from 12:00 local time on Saturday 2 February. Fleet racing for the remaining fleets starts at 10:30 local time. The Medal Races for all 10 classes will be streamed live on World Sailing’s YouTube and Facebook channels starting at 12:00 local time. A key component of Laser sailor Hermann Tomasgaard’s (NOR) preparation for the 2019 Hempel World Cup Series Miami involved a week at the Laser Training Center in Cabarete, Dominican Republic. Aside from the obvious—tropical mid-winter weather—Tomasgaard went there for the consistently strong winds. Overnight leader Radoslaw Furmanski (POL) struggled in today’s three races in the Men’s RS:X class, but he’s still at the top of the leaderboard thanks to his strong start to the regatta and a tiebreaker, which positions him provisionally ahead of Pierre le Coq (FRA). Mateo Sanz Lanz (SUI) is third, just four points back. With just 20 points separating first from 10th, there is the potential for the results to shift around quite a bit in tomorrow’s Medal Race. Paige Railey showed again that experience counts, both in terms of time in the Laser Radial and time on tricky Biscayne Bay. She won two races today, finished fifth in a third, and will carry a nine-point lead into the final day of full-fleet racing. Dongshuang Zhang (CHN) won the third race and is currently second. Anne-Marie Rindom (DEN) is third, 27 points off the lead. Railey is currently throwing out a black flag disqualification, which does make her margin for error in tomorrow’s final two races a little narrower than some of the other top sailors. Friday is a crucial day for the 49er, 49erFX, Nacra 17, Men’s RS:X and the Women’s RS:X at the Hempel World Cup Series Miami as the sailors aim to qualify for Saturday’s Medal Races. 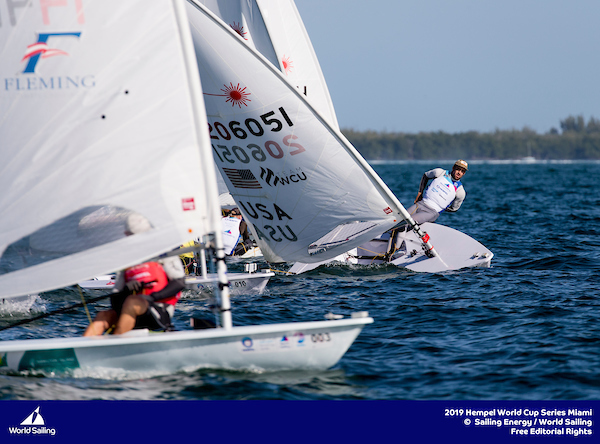 Live tracking, sailor analytics, live weather data and racing status will be available on the platform here – https://wcs2019-miami.sapsailing.com/. The Hempel World Cup Series is a world-class, annual series of Olympic sailing for elite and professional sailors. Over 2,000 of the World’s leading sailors, representing over 75 nations have competed in the Hempel World Cup Series which offers a definitive guide to the best-of-the-best in the Olympic sailing world. Not long after the start of the second Finn class race on Day 3 of the 2019 Hempel World Cup Series Miami, a nasty line of storm clouds moved southwest over the racecourse on Biscaye Bay and the skies opened up. The wind went haywire and Luke Muller (Fort Pierce, Fla.) went back in time. Muller rounded the first mark in third, took over the lead on the downwind leg and held on for his first win of the regatta. While his other two finishes today were both outside the top 10, consistency has been tough to come by in the 29-boat Finn fleet, and Muller, with five of 10 full-fleet races in the books, is sitting comfortably in fifth place. For Muller, this regatta serves as something of a launching point for the long final leg of his Olympic campaign. Paine won bronze, the United States only sailing medal, at the Rio 2016 Olympics. So far, Paine has struggled in this event, though he did trend in the right direction today with a ninth and 11th in the last two races. With two days of racing remaining before the double-points Medal Race on Sunday, there is plenty of opportunity for Paine to climb back into the top 10, if not higher. While two-time Olympian Paige Railey (Clearwater, Fla.) grew up on Florida’s other coast, she’s spent plenty of time on Biscayne Bay over a career in the Laser Radial class that is closing in on two decades. Still Railey said this week has been as mentally challenging as any she can remember. “Plugging away” scored Railey a second in the first race and a first in the third. She was disqualified from the second race for starting a hair early. But Railey, who is an expert at focusing on the big picture, was able to take some positives from that disappointing score. With the throwout applied, Railey is second by just two points to Alison Young (GBR). Dongshuang Zhang (CHN) is third and will be one to watch as Railey noted that Chinese sailor may be the only one in the Laser Radial fleet with a speed edge. Erika Reineke (Fort Lauderdale, Fla.) also had a solid day, with a fifth, seventh and 24th. She is seventh overall, but just nine points out of bronze. Farrah Hall (Annapolis, Md.) had her best race of the regatta, a 21st, to open the day and she is currently 28th in the Women’s RS:X class. Hall represented the United States in the London 2012 Olympics. Rio 2016 Olympian Pedro Pascual also had his best individual performance of the regatta today, with a 12th in the second race. He’s currently 36th of 54 in the Men’s RS:X class. Both of the RS:X fleets will aim for three more races tomorrow before Saturday’s Medal Race. Stu McNay (Providence, R.I.) and David Hughes (Miami, Fla.) finished second in the last of two races for the Men’s 470 fleet. While their first race was a disappointment, a 15th in the 37-boat fleet, the veteran duo is now tied on points for first place with Anton Dahlberg and Fredrik Bergström (SWE). With just four of 10 scheduled full-fleet races completed, however, there’s a lot of racing left for this fleet. Lucas Calabrese and Jack Parkin are also in the top 10, after a solid 11-4 today. The Women’s 470 fleet is also sitting on four races, two behind schedule. Atlantic and Nora Brugman are the top American team in 12th. Carmen and Emma Cowles (Larchmont, N.Y.) are 15th. Nevin Snow (San Diego, Calif.) and Mac Agnese (Fort Lauderdale, Fla.) had two strong races today and two they’d probably like to forget. Nonetheless, they are still in the top 10, with one more day of racing before the fleet is knocked down to the top 10 teams for Saturday’s Medal Race. Ian Barrows (St. Thomas, U.S.V.I) and Mitchell Kiss (Holland, Mich.) are 14th. Stephanie Roble (East Troy, Wis.) and Margaret Shea (Wilmette, Ill.) dropped a few places today, but are still firmly in the top 10 in the Women’s 49erFX class. Paris Henken (Coronado, Calif.) and Anna Tobias have moved within reach of qualifying for the Medal Race. They are currently 13th. Rio 2016 Olympians Bora Gulari (Detroit, Mich.) and Louise Chafee (Warwick, R.I.) have taken over the top spot among the seven American teams competing in the Nacra 17 class. They are eighth. Sarah Newberry and David Liebenberg (Livermore, Calif.) are ninth, just two points behind. Ravi Parent (Sarasota, Fla.) and Caroline Atwood are 13th while Riley Gibbs (Long Beach, Calif.) and Anna Weis won a race today, finished sixth in another, and have moved up to 15th overall. Racing resumes once again tomorrow at the earlier time of 10 am. The 49er, 49erFX, Nacra and RS:X fleets will sail their final day of qualification ahead of Saturday’s Medal Races.